The scorpion's most notorious attribute is its poisonous sting. While it is true that some scorpions are among the most poisonous land animals, reports of their lethality are probably exaggerated. In these pages, I will attempt to separate fact from fiction regarding the scorpion's lethal sting. How does the toxicity in animals relate to toxicity in humans? How much venom can a scorpion inject? What are the signs and symptoms of scorpion envenomation? How many people are killed by scorpions? The sting or stinger, also called a telson, is located at the very end of the postabdomen of the scorpion. The base of the sting, or vesicle, is globular and tapers posteriorly to a very narrow, curved spine called the aculeus. The vesicle contains a pair of glandular sacs that produce and store the various components of the scorpion's venom. The aculeus is like a hypodermic needle. It is hollow and very, very sharp. There is a pair of openings near the tip from which the venom is delivered. Each venom sac is connected to one of the openings by a venom duct. The venom sacs are controlled voluntarily so the scorpion can regulate how much venom is injected with each sting. Some scorpions don't inject any venom when stinging. Scorpions use their sting for a variety of purposes. The most obvious use of the sting is in prey capture. Prey is first grasped firmly with the pincers. For many scorpions, nothing more is required to subdue the prey for external digestion. Prey that cannot be killed by simply crushing with the pincers is usually stung one or more times. By using their venom, small scorpions with weak pincers can bring down prey as large as themselves. A second use of the sting is in defense. A well-placed sting serves to ward off many would-be predators. I once placed an adult Centruroides vittatus into the terrarium of an unidentified solpugid fully intending for the solpugid to eat the scorpion. The solpugid attacked immediately, grasping the scorpion by the face with its enormous chelicerae and lifting its hapless prey off the ground. The scorpion responded by stinging its attacker squarely between the eyes, killing it instantly. The victorious scorpion then proceeded to make a meal of the solpugid. Still, scorpions are heavily preyed upon by a great many animals. The sting of the scorpion appears to be inconsequential to some of these predators. I once had a captive Sceloporous lizard that regularly dined on Centruroides scorpions and appeared to suffer no ill effects from the stingings it received. Nevertheless, the use of the sting as a defensive weapon cannot be underestimated. Why else would some scorpions evolve toxins that appear to be specifically designed for use against vertebrates? Most scorpions that possess these special toxins do not eat vertebrates. A third use of the sting is during mating. Males have often been observed stinging females or stroking them with their telsons. It seems likely that some scorpions possess pheromones that might improve female receptivity or provide species identification during the mating ritual. The importance of the sting for this purpose is only just now being realized, but as an example of its potential influence on scorpion evolution, I offer the genus Hadogenes. These scorpions specialize in rock crevices and are markedly flattened. The postabdomen of these scorpions is laterally flattened and is held sideways. Because of the tight spaces in which these scorpions live, the postabdomen would have to be very long in order to be brought to bear in front of the scorpion. The typical overhead attack is not possible. Fortunately the pincers are quite large and powerful enough to subdue prey so that stinging is not necessary. While the postabdomen of the female is not unusually long, and thus cannot be brought to bear in front of the scorpion, that of the male is ridiculously long. Assuming that prey capture and predator defense requirements are similar in both sexes, the best explanation for this dimorphism is that the sting is more important for mating than it is for prey capture or defense. Yes. All species of scorpion are poisonous. If you are an insect, and therefore potential food for the scorpion, then all scorpions are deadly poisonous. However, only a very small number of the over 1050 known species are dangerous to humans. Most produce a bee-sting like reaction in humans. It is very painful, but not life-threatening. The scorpion's venom is comprised of a variety of compounds, most of which have not been investigated. The venom from a single scorpion may include several neurotoxins, histimine, seratonin, enzymes, enzyme inhibitors, and other unidentified compounds. Each of these compounds must have evolved for at least one of the above purposes of the scorpion's sting. The venom may also contain mucous, various salts, peptides, necleotides, and amino acids. Because of the medical importance of a few species, it is the neurotoxins that have received the most research attention. The numerous neurotoxins in the scorpion's venom are often considered to be target specific. Each one targets the nerve cell of a specific kind of animal. Some neurotoxins may have greatest activity against insects, others may be most lethal to molluscs, and still others may target mammalian nerve cells. Furthermore, different toxins may target different sites on the nerve cell. Some components in scorpion venom appear to have no other function than to cause localized pain or discomfort in the victim. By analogy with bees, which use their venom defensively, these components are hypothesized to have evolved as defensive secretions. Like honey bees, the venom of some scorpions has been found to contain phospholipase A, an enzyme, and histamine, which dilates blood vessels. Serotonin, which causes constriction of blood vessels in mammals, is also produced by some scorpions and has been suggested as a pain-producing compound (seratonin in insects increases muscle excitation). Other researchers have found that serotonin in the scorpion's venom induces uterine contractions and causes spontaneous abortions in rats. They suggest that serotonin is responsible for spontaneous abortions in women who are stung by scorpions in their first trimester. Several other enzymes, which may be responsible for localized reactions, are known from scorpion venom. Of particular interest is the venom of the west Asian scorpion, Hemiscorpius lepturus. This scorpion's venom has not been characterized, but it is reported to be highly cytotoxic. Inflammation and induration at the site of the sting may be followed by necrosis and sloughing of the skin. Large blisters may also develop around the site of the sting. Overall, these cases are very similar to envenomation by brown recluse spiders. The target of the scorpion's neurotoxin is the victim's excitable cells, primarily nerve cells. The neurotoxins specifically target the voltage-dependent sodium and potassium ion channels on the nerve cell's membrane. This action leads to an alteration of the nerve cell's firing pattern (prolonged action potential and/or repetitive firing) and an accumulation of sodium or calcium ions within the cell. The end result is a massive release of neurotransmitters from the affected tissues. These affects cascade as additional tissues are affected by the neurotransmitters. In vertebrates, the systemic effects observed after scorpion envenomation are probably the result of the release of massive quantities of catecholamines from the victim's adrenal glands. The scorpion's venom, therefore, is not directly responsible for the severe manifestations we see in some cases. Instead, the neurotoxins induce the victim's own chemical communication system to destroy the victim's homeostatic functions. Please refer to Simard and Watt [1990. Venoms and toxins. Pages 414-444. In: "The Biology of Scorpions" (G. Polis, ed.). Stanford University Press, Stanford, California] for a more comprehensive discussion of the action of scorpion neurotoxins. In terms of their toxicity by weight, some scorpion venoms are among the most deadly of animal poisons. Table 1 below depicts the lethal dose (LD50) for several species of scorpion as reported in the scientific literature. The LD50 is the amount of toxin required to kill 50% of the test animals. The doses, expressed in milligrams (mg) of venom per kilogram (kg) of mouse, are for laboratory mice. The lower the LD50, the more potent the venom. TABLE 1. Reported toxicities of some scorpions of medical importance. *LD50 is the amount of toxin (Lethal Dose) required to kill 50% of test animals. The dose is expressed in mg of venom per kg of mouse. **Method: &nbsp iv = intravenous injection; ip = intraperitoneal injection; sc = subcutaneous injection. 1 Hassan, F. 1984. Production of Scorpion Antivenom. Pages 577-605. In: Handbook of Natural Toxins. Volume 2. Insect Poisons, Allergens, and Other Invertebrate Venoms (A. T. Tu, ed.). Marcel Dekker, Inc., New York. - The original values are reported as micrograms per 16-18 grams of mouse. Each value has been corrected to mg per kg of mouse using a conservative value of 16 g for the weight of the mice. 2 Johnson, B. D., J. C. Tullar, and H. L. Stahnke. 1966. A quantitative protozoan bioassay method for determining venom potencies. Toxicon, 2:297. 2 Stahnke, H. L. 1963. Some pharmacological and biochemical characteristics of Centruroides sculpturatus Ewing scorpion venom. Second International Pharmacol. Meet., Prague, Czechoslovakia, 63. 4 Watt, D. D. 1964. Biochemical studies of the venom from the scorpion Centruroides sculpturatus. Toxicon, 2:171. 5 Whittemore, F. W. and H. L. Keegan. 1963. Medically important scorpions in the Pacific area. Pages 107-110. In: Venomous and Poisonous Animals and Noxious Plants of the Pacific Region (H. L. Keegan & W. V. MacFarlane, eds.). The Macmillan Company, New York. - The original values are reported as milligrams per 14-18 grams of mouse. The value has been corrected to mg per kg of mouse using an average value of 16 g for the weight of the mice. 6 Zlotkin, E., F. Miranda, and H. Rochat. 1976. Venoms of Buthinae. C, Chemistry and pharmacology of Buthinae scorpion venoms. Pages 317-369. In: Arthropod Venoms. Handbook of Experimental Pharmacology, vol. 48. Springer-Verlag, Berlin. With the exception of Hemiscorpius lepturus, to which several deaths have been attributed, it appears that the most dangerous scorpions (those to which deaths are routinely attributed) have an LD50 below 1.50 mg/kg. Some scorpions that are known to cause severe envenomation, but are not listed in Table 1 include Mesobuthus tamulus from India and Tityus trinitatis from Trinidad. Both are reported to be responsible for deaths in their respective countries. Only if you are an insect. The venom of most scorpions (there are over 1050 described species) has never been analyzed. This is because practical experience has shown that their sting is not life-threatening to humans. Table 2 below shows the LD50 for some of the scorpions that are not of medical importance. Those species with an LD50 between 2.00 mg/kg and 5.00 mg/kg may be of concern and could cause death under certain conditions. It is also important to remember that even a nearly nontoxic species can cause death if the victim has a severe allergic reaction to the venom. TABLE 2. Reported toxicities of scorpions of little or no medical importance. *LD50 is the amount of toxin ( Lethal Dose) required to kill 50% of test animals. The dose is expressed in mg of venom per kg of mouse. 1 Bücherl, W. 1971. Classification, biology and venom extraction of scorpions. Pages 317-347. In: Venomous animals and Their Venoms. Volume 3. Venomous Invertebrates (W. Bücherl & E. E. Buckley, eds.). Academic, New York. 2 Hassan, F. 1984. Production of Scorpion Antivenom. Pages 577-605. In: Handbook of Natural Toxins. Volume 2. Insect Poisons, Allergens, and Other Invertebrate Venoms (A. T. Tu, ed.). Marcel Dekker, Inc., New York. - The original values are reported as micrograms per 16-18 grams of mouse. Each value has been corrected to mg per kg of mouse. 3 Ismail, M., O. H. Osman, K. A. Gumaa, and M. A. Karrar. 1974. Some pharmacological studies with scorpion (Pandinus exitialis) venom. Toxicon, 12:209. 4 Johnson, B. D., J. C. Tullar,and H. L. Stahnke. 1966. A quantitative protozoan bioassay method for determining venom potencies. Toxicon, 2:297. 5 Marinkelle, C. J. and H. L. Stahnke. 1965. Toxicological and clinical studies on Centruroides margaritatus (Gervais), a common scorpion in western Colombia. Journal of Medical Entomology, 2(2):197-199. 6 Zlotkin, E., F. Miranda, and H. Rochat. 1976. Venoms of Buthinae. C, Chemistry and pharmacology of Buthinae scorpion venoms. Pages 317-369. In: Arthropod Venoms. Handbook of Experimental Pharmacology, vol. 48. Springer-Verlag, Berlin. We must be careful to keep our perspective when discussing the toxicity of scorpion venom. Toxicity tests are carried out on many types of animals that may vary in their susceptibility to the venom. At least one researcher found substantial differences in susceptibility between two different strains of mice. Thus, it is often difficult to compare results from two different studies done by two different workers using different strains of laboratory mice. And even if the mice were equally susceptible, how does their susceptibility compare to that of humans? Are we more or less susceptible? Furthermore, there is a lot of evidence indicating that the toxicity of any species' venom is highly variable across its entire distribution. Thus, a species that is dangerous in one area, may not be dangerous in another. When electrical stimulation is used to "milk" the venom glands of scorpions, an average yield of anywhere from 0.006 mg to about 2.0 mg of venom can be obtained from a single scorpion. The average is probably less than 0.5 mg. And it is likely that they inject even less than this amount under natural conditions. Still, a highly venomous scorpion, say with an LD50 of 0.5, delivering a full load of 0.5 mg venom, could inject enough toxin in one sting to kill half of one kg (about 60 mice weighing 16-18 g each) of lab mice. We don't know, exactly. The only information we have on the toxicity of scorpion venom in humans is from actual stingings (you can imagine how difficult it would be to get people to volunteer for a human LD50 study!). From clinical reports, there appear to be several factors that modulate scorpion venom toxicity in humans. The primary factors appear to be: 1) the toxicity of the venom of the scorpion involved; 2) the quantity of venom injected by the scorpion; 3) the size of the victim; and 4) the general medical condition of the victim. Scorpions not considered of any medical importance normally have venoms that are of low toxicity to mice. These scorpions normally produce a localized reaction similar to that a honeybee sting. They would have to be several feet long before they could produce and inject enough venom into a person to kill them. In scorpions with higher venom toxicity, systemic reactions become more common. It is a good thing that these species are not any larger than they already are, otherwise deaths from their stings would be more common. Several factors may affect the quantity of venom injected by a scorpion. Venom release is under voluntary control, so the scorpion itself can vary the amount of venom injected. Other factors may include the compositional state of the venom, penetration and duration of the sting, and the location of the sting on the victim's body. The most dangerous scorpions are those that are capable of injecting relatively large quantities of highly toxic venom. Body size of the victim is also very important. Children, because of their small size, are at greater risk of severe envenomation than are adults. Most deaths due to scorpion envenomation occur in small children. The presence of pre-existing medical conditions such as pneumonia, hypertension, and certain heart ailments can turn otherwise normal systemic reactions into life threatening situations. Persons with such conditions are at greater risk of severe envenomation than are healthy persons. Some people are allergic to scorpion venom in the same way that some are allergic to honey bee venom. In such cases, very severe effects, including death, can occur very rapidly and are not related to the toxicity of the venom. Deaths due to envenomation by non-medically important species are usually the result of allergy induced anaphylactic shock. Venoms from scorpions produce a great variety of clinical symptoms in victims. The symptoms for any given incident vary according to several factors: species involved, toxicity of the venom, amount of venom injected, size of the victim, the victim's overall health condition, and probably a number of other factors that vary from individual to individual that cannot be quantified. Envenomations are usually categorized into two or three levels of severity: 1) localized effects, 2) systemic effects, and 3) systemic effects with central nervous system involvement. Localized effects are common to nearly all scorpion stings regardless of the toxicity of the venom. These symptoms are restricted to the site of sting and include intense pain, minor swelling, redness or induration, numbness, tenderness, and tingling. Intense pain normally subsides within one hour, giving way to numbeness, tenderness, and tingling at the site of the sting. This normally results in the favoring of an affected limb. These symptoms normally fade after 24 hours. I compare the pain of most scorpion stings to hitting oneself on the thumb with a hammer. While excruciatingly painful, the sting does little or no visible tissue damage. Furthermore, the actual entry wound is not normally visible. The range of systemic involvement is very great. The following signs and symptoms are often reported following scorpion envenomation: intense pain that radiates towards the body and is especially acute at the armpits and groin areas, aggitation or anxiety, increased body temperature, sweating, chills, a feeling of numbness or swelling of the face, tongue and throat, pain or tightness in the chest or back, and occasionally slightly increased heart rate and blood pressure. The victim is normally very anxious and some authors have attributed minor systemic symptoms to this anxiety. These systemic effects may occur very rapidly or may not manifest until several hours after the stinging incident. Systemic effects with CNS involvement are signs of severe envenomation. Such severe systemic involvement appears to be the result of massive release of catecholamines by the victim's adrenal glands. Any of the following signs or symptoms is cause for concern: fever, excessive salivation, involuntary tearing, nausea or vomiting, confusion, coma, convulsions, increased or decreased heart rate or blood pressure, increased or involuntary defecation or urination, increased fluid excretion into the bronchioles and lungs, or swelling of the lungs. Death is usually due to heart or respiratory failure. Scorpion envenomation is a common hazard in many parts of the world. Unfortunately, we do not have a clear picture of how many people are stung world-wide each year, or even exactly how many are killed each year. The issue of scorpion envenomation continues to be surrounded by myth and sensationalism. Most scorpion stings probably occur in indigenous populations by scorpions that are of little or no medical importance. These people are accustomed to this threat and therefore treat scorpion stings the way most people would treat a bee or wasp sting. The vast majority of scorpion stings, perhaps hundreds of thousands every year on a world-wide basis, go unreported and require no medical treatment of any kind. In some countries, however, scorpion envenomation is a serious public health threat. The highly toxic nature of the venom of some scorpions gives people good reason to fear them. Thousands, perhaps tens of thousands, of cases of scorpion envenomation are probably seen by medical professionals each year world-wide (unfortunately, there is no standard mechanism for reporting scorpion envenomation, so this is a only crude estimate). Of these cases, a few result in death for the victim. Table 3 presents the results of several retrospective studies conducted on scorpion envenomation around the world. Generally, these studies look only at cases that seek attention at medical treatment facilities. The number of stinging victims in the same area that do not seek medical attention is not known. Therefore, the mortality rates reported below are artificially high. TABLE 3. Selected retrospective studies of scorpion envenomation. *This is the number of cases of scorpion envenomation for the specified species recorded at a medical facility (except for the entry from Likes et al. (2), which is the number of calls to the Arizona Poison and Drug Information Center that were the result of envenomation by C. exilicauda--only 8% of these sought treatment at a medical facility). It is not the number of scorpion stings occuring in that geographical area. That number may be several times higher. **Cases of envenomation are often attributed to sustected scorpions by geographical association alone since the offending scorpion is not usually brought in for identification. These are the species identified in the source articles, in order of relative abundance. There is reason to believe that some of these have been misidentified. 1 Balozet, L. 1971. Scorpionism in the Old World. Pages 349-371. In: Venomous Animals and Their Venoms. Volume 3. Venomous Invertebrates (W. Bücherl & E. E. Buckley, eds.). Academic, New York. 2 Likes, K., W. Banner, M. Chavez. 1984. Centruroides exilicauda envenomation in Arizona. Western Journal of Medicine, 141:634-637. 3 Martinez-Medina, M. A., J. Rubio-Lopez, G. Encinas-Miranda, & J. Gomez-Vera. 1983. Picadura por alacrán en niños. Estudio de 100 casos. Boletin Medico del Hospital Infantil de México, 40(12):707-710. 4 Micks, D. W. 1960. Insects and other arthropods of medical importance in Texas. Texas Reports on Biology and Medicine, 18(4):624-634. 5 Neale, J. R. 1990. Scorpion sting syndrome in eastern Riyadh. Annals of Saudi Medicine, 10(4):383-388. 6 Radmanesh, M. 1990. Androctonus crassicauda sting and its clinical study in Iran. Journal of Tropical Medicine and Hygiene, 93:323-326. 7 Radmanesh, M. 1990. Clinical study of Hemiscorpion lepturus in Iran. Journal of Tropical Medicine and Hygiene, 93:327-332. 8 Velasco-Castrejón, O., R. Lara-Aguilera, & H. Al&aacutetorre. 1976. Apectos epidemiológicos y cl&iacutenicos del la picadura de alacrán en una área hiperendémica. Rev. Inv. Salud P&uacuteblica (México), 36:93-103. 9 Waterman, J. A. 1938. Some notes on scorpion poisoning in Trinidad. Transactions of the Royal Society of Tropical Medicine and Hygiene, 31(6):607-694. 10 Waterman, J. A. 1960. Scorpions in the West Indies with special reference to Tityus trinitatis. Caribbean Medical Journal, 12:167-177. While we do not want to diminish the importance of scorpion envenomation as a public health threat, especially in developing countries, it is interesting to note how misleading the statistics can be. One study reports one death due to envenomation by Centruroides vittatus, the common striped scorpion of the United States. During the study period, only 27 persons are reported to have sought medical treatment for stings by this non-medically important species. The resulting mortality rate is greater than that for Androctonus australis, which is a truly dangerous scorpion. What is not shown is that thousands of people were stung by C. vittatus and did not seek medical attention. If we could include these people in the calculation, the mortality rate would be much, much lower. The same can be said for the other figures as well. To appreciate the problem in some parts of the world, we must extrapolate beyond the published data. In the study by Velasco-Castrejón et al. (1976) there were four deaths reported among 100 cases in one year in one hospital serving a population of over 21,000. Assuming that the entire population is at risk for death by scorpion envenomation, that gives us an estimated mortality rate of 0.019%, which is very high. The combined populations of all the Mexican states from which C. limpidus has been reported is 32,570,369 (1992 figures). Assuming again that all of these people are at risk for death by scorpion envenomation, I estimate that México should experience about 6188 deaths per year from C. limpidus alone. However, reported estimates for the entire country are only 800-1000. These are only estimates, actual figures do not seem to be available. Still the estimates, based on published figures, seem to be very low. The estimated number of stings in all of México is between 100,000 and 300,000. Again, this seems very low. Based on the study by Velasco-Castrejón et al. (1976), the number of persons seeking medical attention should be over 150,000 per year just in the states where C. limpidus is found. Adding in the populations of states where C. suffusus and C. exilicauda are found, would greatly increase these figures. (I am not a physician. The information provided here is for reference and entertainment purposes only and should not be interpreted as a recommended course of treatment for scorpion envenomation. – Dr. Scott A. Stockwell) The sting of most species of scorpion is not dangerous to humans. The sting of these scorpions is usually likened to that of honeybee. Normally, no treatment is required. Just remain calm, relax, and wait for the pain to subside (30-60 minutes). The first-aid recommendations of the Arizona Poison and Drug Information Center can be applied to all cases of scorpion envenomation. Usually, there is no perceptible swelling or discoloration at the site of the sting. Therefore, you may not be able to determine the exact location of the sting on small children. Only about 20 of the over 1050 known species have venom that is sufficiently toxic to cause death in humans. These few species are found only in certain parts of the world. Contrary to popular belief, the sting of even the deadliest of scorpions is not invariably fatal. Victims may experience a range of symptoms. Those victims experiencing local reactions or non-life threatening systemic reactions will likely make complete, rapid recoveries without visiting a medical treatment facility. The Arizona Poison and Drug Information Center recommends cleaning the site with soap and water, cool compresses, elevation of the affected limb to approximately heart level, and an analgesic as needed for minor discomfort. Many people also take oral antihistimines to help relieve the pain from the sting, however, these may cause drowsiness and confuse a physician if a visit to the hospital becomes necessary. In any case of envenomation, it is important for the victim to remain calm and try to relax. Remember that the victim's chances of actually dying, even from a highly venomous species, are relatively small. Most people who seek medical attention after being stung by deadly scorpions are given basic first-aid treatment and released later the same day. Often, by the time a victim reaches a hospital, has filled out a bunch of insurance forms, and waited to see a physician, the pain has abated and they feel much better. The treatments provided at a hospital can vary greatly depending on the opinions of the physicians working there. Many physicians now advocate the management of scorpion envenomation symptomatically. Since every case is different, the treatment of each case must be different. Unfortunately, none of the treatments for scorpion envenomation has been clinically tested. Furthermore, the self-limiting nature of scorpion envenomation makes testing difficult. Most patients recover fully and rapidly without treatment, so it is difficult to say whether any particular course of treatment has any beneficial affect at all. While it is beyond the scope of this page to get into the clinical details of all the various treatments, it is instructive to look at some of the treatments that do not appear to work. There are many home-remedies and homeopathic treatments for scorpion envenomation. Most are probably not harmful, but probably don't help either. Occasionally, certain plants are believed to have curative powers. Parts of these plants may be applied to the wound, eaten, or worn around the neck. Scorpions are sometimes placed into a variety of oils, which may then be used as antidotes for envenomation. It is common in some places to drink a "tea" made from the offending scorpion. In other areas, the scorpion is eaten, either cooked or raw. I have even read of customs in which the scorpion's stinger is removed and "surgically" implanted beneath the skin of the victim. This latter treatment seems ill-advised. Many physicians have used powerful narcotics to treat scorpion envenomation. Morphine, meperidine chloride, amobarbital, etc. have been used in the past to treat severe agitation, a common symptom of severe envenomation in children. Most workers do not advocate their use now. The danger seems to come from respiratory depression which may be compounded by the envenomation, and lead to respiratory failure. 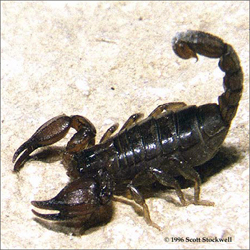 Scorpion antivenoms have been used in the treatment of scorpion envenomation for a very long time. However, the efficacy of these antisera has only recently been clinically tested. Physicians are divided on the use of antivenom, which is usually available where dangerous scorpions are found. Many authors have reported that antivenoms are not effective in treating scorpion envenomation. Others claim that antivenoms definitely reduce the mortality rate from scorpion envenomations. Some of the problems with commercial antivenom include its method of preparation, its recommended dosage, and its method of injection. Ismail (1995) suggests that antivenoms produced from crude venom (not purified to isolate the specific toxins) are much less effective than antivenoms from purified venom. While their ability to neutalize whole venom, which contains many large molecules that are non-toxic, is good, their activity against the smaller, highly toxic venom molecules is lower than advertized. As a result, the actual dosages of antivenom required to neutralize the effects of an average sting are 10-50 times the recommended dosage on the label. Furthermore, antivenom is often injected intramuscularly. Venom is thought to be absorbed from the subcutaneous sting site much faster than antivenom. The venom therefore has the opportunity to exert its effects and be neutralized by the body before it can be counteracted by the antivenom. Ismail (1995) recommends that large doses of antivenom be administered intravenously for successful treatment.